The Milli-Q Gradient A10 Water Purification System offers your lab reliable access to Type 1, ultrapure water for applications in spectrophotometry, spectroscopy, chromatography, and biochemistry. By using an existing source of pure water, this system further purifies water with a three step process. Pretreated water enters into the water purification system and through the Q-GARD for its first step. The water is passed through a dual wavelength UV lamp, destroying bacterial and oxidizing organic molecules and reduce TOC levels. The Quantum cartridge then removes oxidation by-products and trace ions. Lastly the purified water then passes through an Ultrafiltration module, that acts as a barrier to organic molecules, colloids and particles 5000 Daltons or greater. Located at point of use, the 3-way valve of this water purification system lets you direct the ultrapure water through a final filter that removes any remaining bacteria and particles greater than 0.22 µm in size, and prevents system contamination at point of use. The resulting ultrapure water helps data reproducibility, reduces fouling and baseline noise, giving you accurate research results. The Milli-Q Gradient A10 Water Purification System is compact and be stored anywhere in the lab that’s convenient, bench top, under the bench, or on a wall. The flowrate can run up to 1.5 liters a minute, with a noise level or 42 dB A. 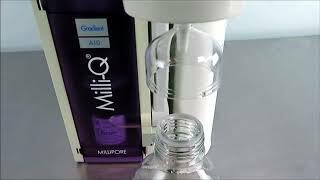 The Milli-Q Gradient A10 Water Purification System has a built in TOC monitor to alert you when the filter pack should be changes. While this system does not come with brand new filters, users may purchase cartridges more application specific directly from Millipore. This water purification system has a number of modes accessible through the key pad, or are operated automatically by the microprocessor including system maintenance, TOC monitoring and alarm displays. This instrument has been tested to make sure it dispenses water, and that lamps are all in good working order. All of our lab equipment comes backed with our standard warranty. Should you have any questions, please don't hesitate to contact us.